Jewelry should be checked every six months and cleaned frequently. Just as the sun’s harmful rays can damage our skin, light and heat can affect a colored gemstone’s durability and color. Over time, and in excess, they can also fade or damage some gemstones. Excessive heat and sudden temperature changes may also fracture some gems. Heat can easily remove the natural moisture these gems need to keep their beauty. Pearls, for instance, can dry out, crack and discolor. Opals can turn white or brown, develop tiny cracks, and might lose their play-of-color. Most colored gems can be cleaned with warm water, mild dish soap (no detergents) and a soft brush. A pulsed-water dental cleaning appliance and a soft, lint-free cloth can also be used. 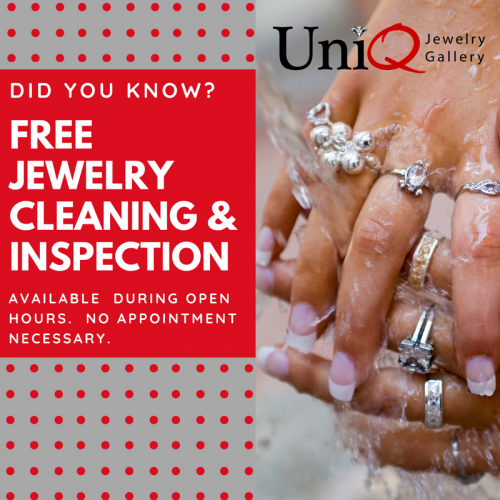 Be sure to rinse your jewelry in a glass of water to remove cleaning solutions since you risk losing loose stones – or even an entire piece of jewelry - if you rinse directly in the sink. Soft gems, such as pearls, on the other hand, can easily scratch. Use a new, clean makeup brush and warm, soapy water to softly clean them. Lay a strand of pearls on a towel to dry. The wet silk thread can stretch − and attract dirt − so don’t touch your strand until it is completely dry. Pearls worn often should be restrung once a year. Proper jewelry storage is often overlooked. Jewelry should never be tossed into a drawer or on top of a dresser − that’s asking for scratches and damaged gems. Most jewelry pieces come in a box or pouch from the store, which is a perfect place to keep them. Sterling silver, for example, should be kept in an anti-tarnish bag or cloth. Jewelry boxes that feature individually padded slots for rings and posts for hanging necklaces and bracelets are also ideal.Pearls and opals draw moisture from the air, so storing your opal or pearl jewelry in a dry area, such as a safe deposit box, can sometimes do more harm than good. When traveling, protect your jewelry pieces from scratches or other impact damage by padding it in a separate box or case.